... und Little Steven war am Wochenende zu James Gandolfinis Geburtstagsparty eingeladen. James Gandolfini celebrated his 50th birthday with a lavish party in New York over the weekend. The Sopranos star reached the milestone on Sunday and organised a big bash with 150 friends and family on Saturday night. The party took place at the Hundred Acres restaurant in Manhattan and Gandolfini's former castmates Michael Imperioli, Tony Sirico and Steven Van Zandt were all on hand to join the celebration along with the star's wife Deborah and their teenage son, according to the New York Daily News. The publication reports the highlight of the night came when Gandolfini jumped onto one of his friends' backs for a piggy-back ride around the city after leaving the restaurant. Ausserdem war er auf Tony Bennets Party zu Gast. Das hat Stil: Die Krawatte passt zum Kopftuch! 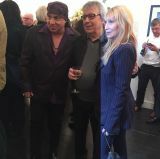 The weekly Rock and Roll radio show hosted and produced by Little Steven Van Zandt is now available on mobile. From the 1950's pioneers, the British Invasion, and classic Girl Groups, to Psychedelic, Surf, Punk, Power Pop, Garage, and the best new bands worldwide, each week Little Steven will take you on a two hour trip down the path of what was cool in all 6 decades of Rock and Roll, celebrate Pop culture, and spin the best Rock and Roll records ever made. You can catch that weeks episode, dive into the archives to hear past shows, listen to exclusive specials only available on the app, and more. Tune in, turn on, and join all the other freaks, misfits, and outcasts enjoying Little Steven’s Underground Garage, Maximum Rock and Roll!" Man kann sich verschiedene Shows nochmal anhören bzw. runterladen, um sie offline zu hören. Steven in der Fotoausstellung "In 80 Jahren um die Welt" zum 80. Geburtstag Bill Wymans von gestern in London. I want to be very clear about this. I am considering a tour of my own summer of '17 ONLY BECAUSE THE E ST BAND ARE NOT. We remain together. Und jetzt ist auch Teil des Bluesfestes - quasi der Geburtstagsfete von Bill Wyman die gerade noch läuft. Zudem hat Stevie den "Lifetime Achievement Award" für Bill Wyman zusammen mit Bob Geldof überreicht. Yes the catalogue has been remastered but we have a log jam at the moment. 1st-Vinyl Soulfire Live! Box this year. Then Soulfire Live! BluRay I think Feb. Then the Lilyhammer Score in March. Then the new album in May. And then finally the 5 album Catalogue and Sun City in Sep.
Immer her mit dem Zeug. Ganz besonders die Blu-ray. @Ain't-a-beauty, danke für den Tipp! In den USA soll die Blu-ray ab Februar versendet werden. Da bin ich sehr gespannt wann es dann bei uns soweit ist!! !